Objectives: Breast cancer is a leading cause of death among women in both developed and Third World countries. Fucoidan is a natural plant metabolite produced by brown seaweeds with proven anticancer potential. This study determined the cytotoxic, apoptotic and cell cycle effects of fucoidan alone and in combination with first-line anticancer drugs (cisplatin, doxorubicin and taxol) in MCF-7 breast cancer cells and non-malignant MCF-12A breast epithelial cells as control. Methods: Cytotoxicity was evaluated using the MTT reduction assay. Cell cycle distribution and apoptosis were assessed by flow cytometry using Annexin VFITC/PI and Hoechst 33342 staining, and caspases-3, -7 and -9 activation. Results: Fucoidan alone was significantly more cytotoxic to MCF-7 breast cancer cells compared to the MCF-12A non-cancerous breast epithelial cell line. In MCF-7 cells, the presence of fucoidan caused cell cycle arrest at G1 with accumulation of cells in the sub-G1 phase with the activation of caspases-3,-7 and -9. Furthermore, combination of fucoidan with the standard chemotherapeutic agents-cisplatin, doxorubicin and taxol-significantly enhanced the cytotoxicity of these drugs and accumulation of cells in the G2/M and sub-G1 phases, and induction of apoptosis. No significant differences were observed between fucoidan-treated and untreated MCF-12A cells with respect to cytotoxicity and cell cycle distribution profiles. By contrast, in non-cancerous MCF-12A cells, fucoidan attenuated the toxicity of doxorubicin and cisplatin in combination by increasing their IC50 values. This effect was not demonstrated with the taxol combination. 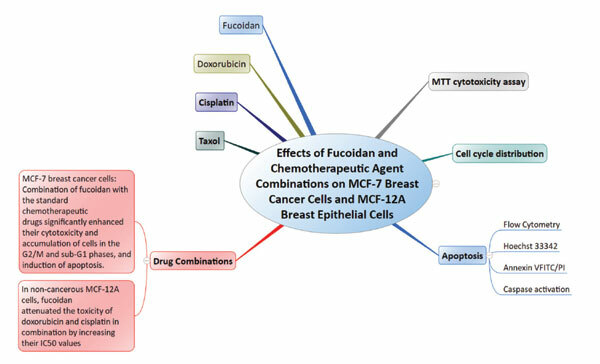 Conclusions: Fucoidan is an effective antitumor agent, either alone or in combination with cisplatin, doxorubicin and taxol in MCF-7 breast cancer cells. Drug combinations that discriminate between cancerous and non-cancerous cells afford a plausible and viable strategy of attaining therapeutic efficacy and avoiding possible toxicity and side effects. These findings suggest that fucoidan is a promising candidate for cancer combination therapies. Keywords: Fucoidan, MCF-7 breast cancer cells, non-malignant MCF-12A breast epithelial cells, apoptosis, caspases, cytotoxicity, cisplatin, doxorubicin, taxol. Keywords:Fucoidan, MCF-7 breast cancer cells, non-malignant MCF-12A breast epithelial cells, apoptosis, caspases, cytotoxicity, cisplatin, doxorubicin, taxol. Abstract:Objectives: Breast cancer is a leading cause of death among women in both developed and Third World countries. Fucoidan is a natural plant metabolite produced by brown seaweeds with proven anticancer potential. This study determined the cytotoxic, apoptotic and cell cycle effects of fucoidan alone and in combination with first-line anticancer drugs (cisplatin, doxorubicin and taxol) in MCF-7 breast cancer cells and non-malignant MCF-12A breast epithelial cells as control.